In 1925 Marchmont House and all of its records were transferred to Barnardo’s who in turn, closed the institution that same year. Marchmont House, now an apartment complex, stands today as a reminder of the estimated 10,000 children who passed through its doors. Listed below are some of the sending organizations that used the placement services of Marchmont House: Annie Macpherson, Barnardo Homes, Liverpool Sheltering Home, Quarrier Homes, Strangeways Institution, Mrs. Blaikie of Edinburgh, Mr. Muir Yardheads, Leith, Miss Wemyss,Washwell House, Bristol Emigration Society, Miss Blaikie of Edinburgh. Ellen Agnes Bilbrough, born November 21, 1841 in Leeds, Yorkshire, England, became concerned with the plight of London’s youth while teaching in the Whitechapel district of London. Despite her best efforts, she realized that a basic education alone was insufficient to change the prospects of her students. It was during her work in London that Ellen became acquainted with Annie Macpherson, the noted child welfare activist. By this time, Miss Macpherson had established the Home of Industry in Spitalfields, London, an institution devoted to housing and educating indigent children. For a brief period, Ellen worked in the Home of Industry as an assistant to Miss Macpherson. In 1869, Annie Macpherson planned to send some of the home’s children to Canada. 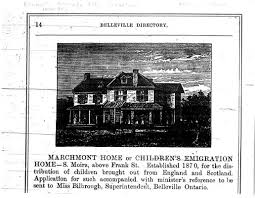 After the funds had been raised to pay the children’s passage, Miss Macpherson, accompanied by Ellen Bilbrough, escorted 100 boys to Belleville, Ontario. 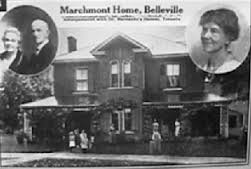 Through the generosity of Belleville’s citizens, Miss Macpherson was able to open Marchmont House, her first distributing home in Canada. Miss Macpherson installed Ellen as Matron of Marchmont and there she would remain until her death. Just two years into its existence, tragedy befell Marchmont when a fire completely razed the property; taking with it the life of six-year-old Robbie Gray. The home was rebuilt only to suffer the same fate in 1875. Undaunted, Miss Macpherson and Miss Bilbrough saw the home built for a third time at a new address, 193 Moira Street. This third edition of Marchmont was constructed of brick as opposed to the previously used wood frame. It also featured steam heat, thereby avoiding the use of open fireplaces. In 1875, Andrew Doyle, the British Local Government Board Inspector wrote a scathing report on the treatment of emigrated children mainly focused on Maria Rye’s organization. In the face of the public outcry following the report, Annie Macpherson set about reorganizing her own operations. Macpherson chose to divest herself of the responsibility of acting as an agent for children brought from homes in Scotland and Manchester. She determined that her home in Galt could handle the number of children she was bringing to Canada and saw no need for further involvement in Marchmont. In 1877, Annie Macpherson relinquished Marchmont to Ellen Bilbrough. Now autonomous, Miss Bilbrough was able to focus her efforts on helping children from homes in Scotland such as Quarrier’s and those from Manchester Homes. Ellen, herself, would travel to Scotland and visit Quarrier’s in Glasgow and Mrs. Blaikie’s Emigration Home in Edinburgh. She returned to Canada with groups of some 75 children. 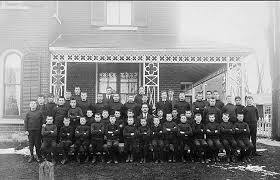 On average, Marchmont accepted approximately 150 children each year. In time, Marchmont became the Canadian receiving and placement home for several of Britain’s smaller child welfare organizations. In 1882, an evangelical missionary travelling in Canada, attended Marchmont for what was intended to be a brief stay. The young man would remain for over a year, assisting Miss Bilbrough with her work. In her book, British Children in Canadian Homes, Miss Bilbrough references an “active Christian who came on a passing visit, remained helping us for over a year, he returned to study at C.H. Spurgeon’s College, London, and is now a devoted preacher of the Gospel”. While Miss Bilbrough avoids mentioning the young man by name, the description is identical to that of her future husband, Robert Wallace. Ellen Bilbrough married Reverend Robert Wallace in 1887 and together they ran Marchmont House. Contrary to social convention of the time, Ellen used the double surname of Bilbrough Wallace. Likely her decision was a matter of preserving the public approval that Marchmont had earned under her direction. Even the most vocal critics of child immigration policies lauded her work and reputation. Throughout her years at Marchmont, Mrs. Bilbrough Wallace maintained meticulous records for each child in her care. Every file included a photograph of the child taken upon their arrival. In most cases, additional photographs were taken at various stages of a child’s development. Mrs. Bilbrough Wallace was more than just the matron at Marchmont; she became the only mother that many of her wards ever knew. Ellen’s interest in the children continued long after their placement in foster households and encouraged continued contact between the children and her. It is said that she delighted in greeting the offspring of Marchmont’s prior residents, many of who consider Ellen to be a grandmother to their own children. The work at Marchmont continued under the direction of Rev. 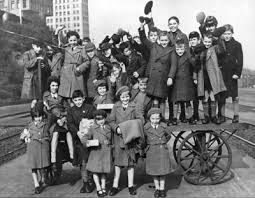 Wallace, with children arriving from Manchester, Worcester, Bath, England and Saltcoats, Scotland. Rev. Wallace remarried in 1902. In addition to the work at Marchmont, Rev. Wallace was active in Belleville’s Baptist church and the Young Men’s Christian Association (YMCA). He took part in conferences on child welfare and championed Marchmont’s cause when meeting with those labour unions most vehemently opposed to child emigration. When Rev. 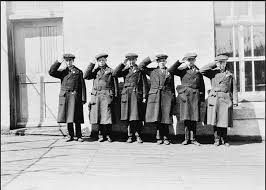 Wallace retired in 1913, it was expected that Marchmont would be turned over to the Manchester and Salford Refuges; however, the outbreak of the First World War brought the practice of child emigration to a temporary halt. When child emigration resumed in 1920, Marchmont was placed under the control of Liverpool Sheltering Home and its director, Lilian Birt.